I found out from a former employee that this was done by campers in the final summer the hotel was opened. Business was so bad that the hotel basically had rented itself out as a summer camp. 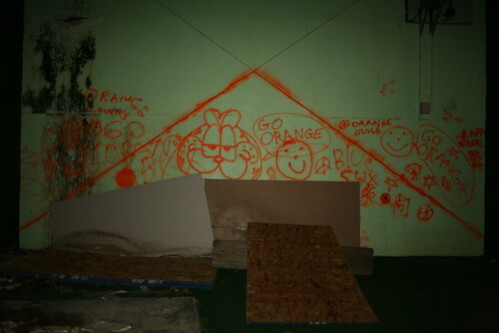 They let the campers spraypaint team imagery on the wall of the fitness center that had just been renovated. Clearly they just had already let go and figured they'd never need that wall again.